In order to ensure we have our customers exact billing and contact information we have provided this Customer Information Form. 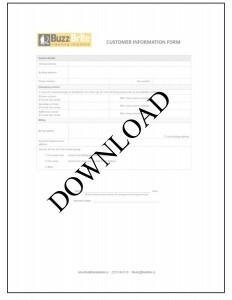 All new Buzz Brite customers are invited to fill out this form. Some residential window cleaning customers may not be requested to fill out this form, as many sections would not apply. Benefits of using this form. Please fill out this form and send to a scanned copy to accounting@buzzbrite.ca . You can always contact us if you have any questions. Thank you.